The Douglas DC-3 C-47 Vol1 DVD features footage of actual DC-3s operating in Colombia, Canada, and the USA. Dakota, Skytrain, Gooney Bird, C-47 - these are all names for one type of aircraft, the Douglas DC-3. Powered by two Pratt & Whitney R-1830 radial engines, this airplane cruises at a speed of 167 knots over a distance of 1300 nautical miles. A total of over 10,000 have been manufactured in the USA and approximately 2000 under license in the Soviet Union as Li-2. See take-offs, landings, taxiing, engine start-ups, cockpit views, passenger and cargo operation and even a landing on one engine. The best way to experience operational DC-3s. Stunning views of the most versatile plane ever built. 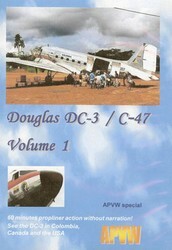 This DC-3 DVD is in NTSC format. Run time is about 60 minutes in color without any narration.